New vessel to be equipped with the Harpoon surface-to-surface guided weapon system, a navy spokesman confirms. A new offshore patrol vessel on order for Thailand’s Navy will be equipped with a guided missile system, a spokesman confirmed this week. As I reported earlier this month, the Royal Thai Navy (RTN) is set to get a second offshore patrol vessel (OPV) in two or three years following the finalization of a new contract between Thai shipbuilder Bangkok Dock and British defense firm BAE Systems (See: “Thailand’s Navy to Get a Boost with New Patrol Vessel”). The 90-meter OPVs are highly versatile ships which can be employed for various functions including the management of exclusive economic zones (EEZs) and disaster relief. On February 29, The Post reported that Vice Admiral Jumpol Lumpiganon, the deputy chief of staff and spokesman for the RTN, had confirmed that the second OPV will be equipped with the Harpoon surface-to-surface guided weapon system. The system, Jumpol said, would push the budgeted cost of the second OPV to 5.5 billion baht, with 2.8 billion baht for vessel design, materials, tests training, technology transfer, insurance and transport, and 2.7 billion baht for operating systems, weapons and project management. The RTN accepted its first OPV, HTMS Krabi, back in 2013. That ship was also built in partnership with BAE Systems at Bangkok Dock’s facilities at the Mahidol Adulyadej. 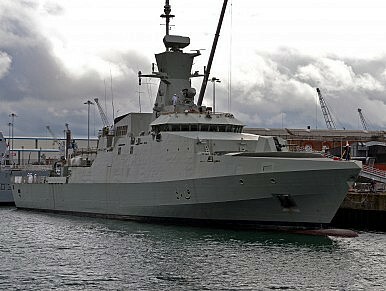 The first OPV cost 2.93 billion baht, a much lower price tag since it did not include the missile system. According to IHS Jane’s Fighting Ships, the Krabi was armed with an OTO Melara 76 mm main gun and two MSI 30 mm guns. Thailand is also expected to pursue other River-class OPV contracts as the Southeast Asian state requires at least five of them, which can be used for routine patrols, border control, disaster relief and the protection of natural resources in the Gulf of Thailand and the Andaman Sea. Thai shipbuilder inks fresh contract with UK firm to build a second offshore patrol vessel. Thailand Will Get First M58 Patrol Gun Boat SoonNaval Visit Puts Vietnam-Thailand Defense Relations Into FocusNew Vessel Puts South Korea-Thailand Defense Ties Into FocusWhat’s Next for Thailand’s New Mini-Submarine Quest?Where Is the New China-Thailand Submarine Deal Headed?